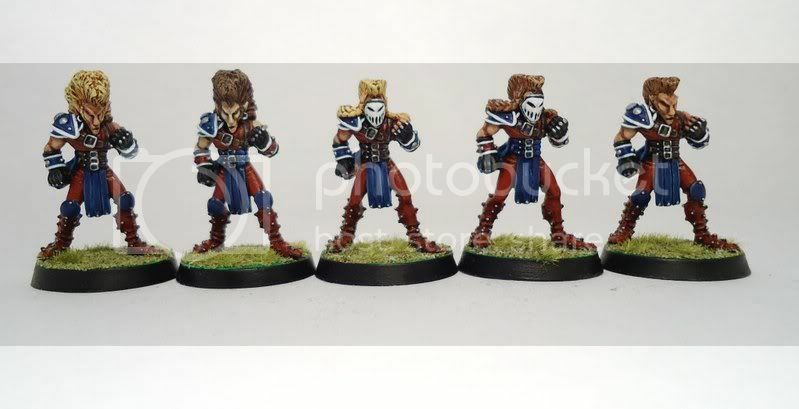 I had been intending to paint up a Slann team for the White Isle Star Bowl III but have had to put them on the backburner. The deadline was rapidly approaching and they will be quite an involved conversion so I had to pick something else instead. I may paint them up for the GT in 2013 though. Luckily Colin over on TFF was selling off a bunch of models so I managed to get my hands on a the fantastic 2nd edition elf team. These and the skaven are some of my favourite models so I knew I could just do a straight paint job without my incessant need to make my models unique kicking in. Ideal for getting a team done on schedule. 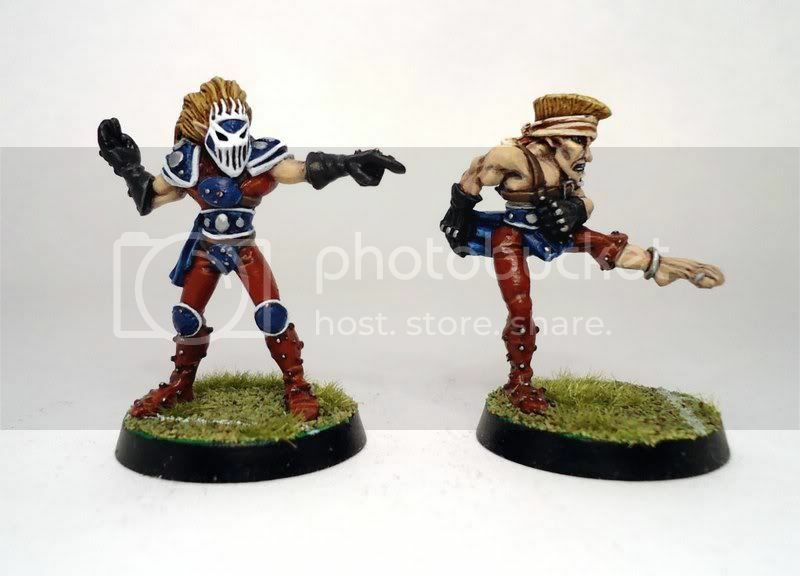 Originally I was going to paint them up blue, red and silver like the Galadrieth Gladiators, but then I came across Horekim fantastic team which did it better than I could. So I modified the colour scheme with red body suits, blue armour and white edging. Plus as it is Jubilee year and London Olympics so nice and patriotic. Of course red, white and blue makes up the USA, French, Russian, Dutch, Norwegian, Australian and NZ flags too. 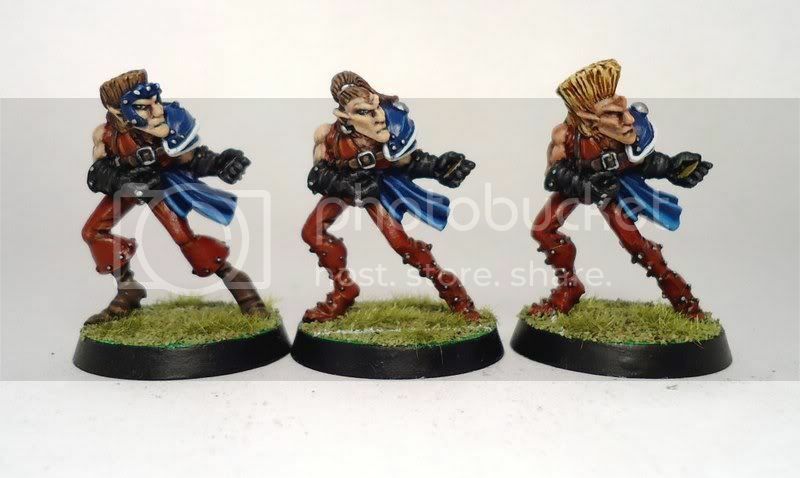 There are 2 of each of the 3 lineman models (1 still have 1 to paint up) so to differentiate them I gave them diffent coloured hair, belts and bracelets. I've always loved the face masks and do think it would be cool to have an entire team with them. However that would require quite a bit of conversion to avoid mass duplication. There are also 3 different types of catcher, the duplicate is being worked on and he will have different coloured hair too. Even though their position is now useless I've got both kicker models, the 2nd one (not shown here) I got cheap off e-bay as he was missing a leg so he's been converted to more of a stomping position. Even elves need to lay the boot in occasionally to wardancers, werewolves and piling on players. I love the thrower model too as he looks great with the mask. Still to come are the 2 blitzers, 1 linemen, 1 thrower, 1 kicker, 2 cheerleaders (2nd edition elf and 3rd edition pro elf) and Eldril Sidewinder so 19 models in total. I'm still working on the Ogre for the Pact team, but no new pics sadly. I hope to finish him before the Star Bowl too. Finally I've got all the bits I need to start work on Topper's Chaos Dwarfs so look forward to getting stuck into them when this team is done. Does anyone else get a bit excited when they see that there's a new spubbbbbbba painting blog, or is it just me? Totally agree on the 2nd edition Elves and Skaven models. Add to them the 2nd edition Human Blocker and we have an all star team on our hands. Great work. I think these are great models, except the kicker. I always hated that ballet pose. Looks so unnatural. @WB: Ballet is pretty pro elf, but yeah, you're right. Your painting job is as usual.... stunning. So much so, that it really does shine a light onto exactly how ugly I find these models. Their faces look like the were used to sweep debris at Fukishima. I cannot tell you how amazing I find your work to be. You have such talent, and I only hope you will continue to share your work with all of us jealous types here who never learned how to paint.